I have a big list of file links for download, and I already downloaded part of the list in the past. I don't want to download again what is already exist in my computer. So I need to compare the filenames in the computer to the filenames at the end of the links, and after that to omit from the links list the duplicates. Trying to get the filenames of the computer by Everything wasn't so easy for me. Ctrl+Shift+C is getting FullPath, and not the Filenames. So I used export to csv to get it. BTW. export to csv doesn't give you to export selected files in Results. Also, there are many columns with values that doesn't have meaning for the simple user. The simple user need the values in the same Format as in Everything. Also, there is a problem with displaying unicode characters in Excel by this method. Anyway, now that I have the both lists, links list and computer filenames list, It's difficult to me to make this comparison and get the new links list. I need help here. Thank You. Last edited by Stamimail on Wed Feb 22, 2017 10:16 am, edited 1 time in total. I'm not quite following & you may need to massage your data first, but UNIX has a uniq (unique) command. Delimiting is done with blank lines. & that should show you only the files that you do not already have, four, in this instance. Change save as type to EFU Everything file list. Type in downloaded.efu and click Save. Convert your "to download" list to a list of filenames as they would appear when downloaded. Save the list as todownload.efu. Open this file in Everything. Select your downloaded.efu and click OK.
You might not be able to see the text in the text box, however there is text there. In the Search box, press the home key to move the caret to the start of the edit box. Type in a single ! Everything should now list all the files in todownload.efu that are not in downloaded.efu. Now it's just a matter of converting the filenames back to their url. Which should be easy enough after exporting to a text file. BTW. export to csv doesn't give you to export selected files in Results. Exporting will always export all the current results, never the selection. Also, there are many columns with values that doesn't have meaning for the simple user. The simple user need the values in the same Format as in Everything. Please make sure you export as CSV. The values will appear almost exactly as they do in Everything. Size is formatted without commas. Dates are formated with ISO8601: YYYY-MM-DD HH:MM:SS. Excel should have no issue parsing these values. Also, there is a problem with displaying unicode characters in Excel by this method. Everything exports CSV as UTF-8. Select your exported csv and click Open. Change File origin to 65001 : Unicode (UTF-8). Click OK to put the data in the existing worksheet at $A$1. I wrote AHK script for your task and I need samples of both your files for debugging. Stamimail wrote: Trying to get the filenames of the computer by Everything wasn't so easy for me. from Menu - File - choose "Copy Name to Clipboard" (must be checked one file or more) to work. I had forgotten from that. Another way to get it is by using F2 of renaming. Syntax: ToDownload List_of_Links List_of_Existing_Files. List of existing files should be in UTF-8 encoding. I've tested the script ToDownload.exe on the 2 lists above. The file Everything.png is not listed in the List_of_Existing_Files, and this link to download Everything.png was omitted from the Output. It will be nice to paste here the code for future tweaks. Last edited by ovg on Thu Mar 23, 2017 10:42 am, edited 1 time in total. Thanks. I finished with my task. Do you want to make a new thread about this tool in AutoHotkey Forum? 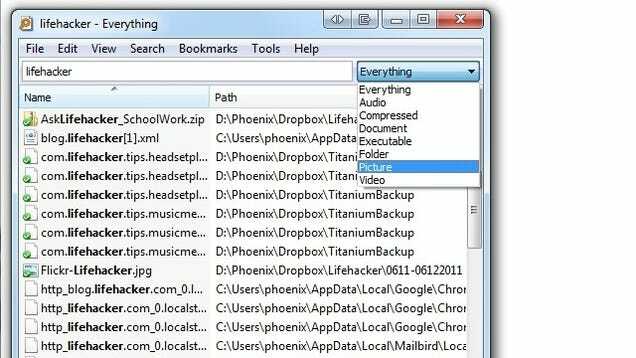 A tool to avoid downloading files you're already downloaded. Is it possible to treat web links in seacrh box as looking for a file? Is there any other use for web links in SearchBox? As for multiple search list, maybe it can be made somehow by Search History, so that the user can search each item in the list one by one. Last edited by Stamimail on Mon Mar 20, 2017 6:01 pm, edited 1 time in total. Stamimail wrote: Do you want to make a new thread about this tool in AutoHotkey Forum? Honestly I don't want to do this ... but if you want - you can DIY - I will not mind. You can freely use script. No problem, and thanks for the script, it was very useful. So you're saying the "file name" of a currently opened web page (URL)? You want to be able to search Everything for, "18rg09rdob9rwjpg.jpg". Well that's basically what how to add everything as a search engine in firefox? does, only that does a search for highlighted text on a web page, rather then the page URL itself. I would think it could be modified to get the "basename" of the page URL? If its working, the alert() can come out. Try new version of script with a choice of files via standard Open/Save dialogs .... May be it will be helpful to you. When start script without parameters, Open/Save dialogs appears. But you can still use command line parameters. Last edited by ovg on Thu Mar 23, 2017 10:37 am, edited 1 time in total. I meant just to copy the full URL from the browser and paste it like it is in the Searchbox of Everything. It's more easy to select/copy the whole URL than to select just the filename at the end of the URL. I tested it. Nice, now it can be done without the use of CMD. 1. I think there is a bug. The last link in "List of Links" is always displayed in Result (see the last result), despite its filename was in the "List of Downloaded Files". It saves the Results file without an extension. I think Save as txt file is expected. If the user press Cancel, it creates unwanted todownload.txt file. Try the new version, please. I fixed the bug with the last link, and your requests are also ready. I've tested it a little. Yes, your program looks ready. Check do you have the latest version? 1427 bytes 23-03-17 16:12. I change Return to ExitApp and add two .Close() statements at the very end of script. For fun: I've added Progress Bar to indicate scanning process. Thank you for informing me you updated the link. Downloaded also the progessbar version. It works. Thanks. I'm trying to say there is always what to improve. but don't bother yourself, unless you see another people interested. Please try new GUI version of the script. Your solution is good for searching a page URL from within a browser. In my case it was different. I had a list of URLs in a txt file. There are cases it is more simple to just copy the link and put it in the Search Box. How does this CMD command work for you? EDIT2: Changed the code to remove a trailing <space> at the end of the flename. Last edited by NotNull on Mon Jun 05, 2017 10:19 am, edited 1 time in total. This topic is already solved a while ago, as mentioned. Now I just wanted to suggest a new option and bring it into a consideration. Nevertheless I didn't want to let you down, so I did 2 tests. In my tests I compared the results of your script with the results of ovg's tool. The results are the same! Bravo. Except for one thing. In your results there is a single <space> that added at the end of each link (unwanted). Stamimail wrote: This topic is already solved a while ago, as mentioned. Ah, OK, didn't pick up on that one (didn't read all of the massages, just a (very) quick scan). Not that it matters anymore, but the issue withe the extra space can be solved by replacing "echo %X >>" with "echo %X>>"
I pretty sure your code will be useful for me or for someone some day. Stamimail wrote: I pretty sure your code will be useful for me or for someone some day. Good thinking! Changed the code .. Thank you very much for ToDownload_GUI. I used it many times. 3. In the scanning/proccessing Dialog, at the end ,a summary how many files outputed. Stamimail wrote: Thank you very much for ToDownload_GUI. I'm newbie with AHK and implementing this can take some time. Sorry, I didn't understand what you mean. Could you please explain more carefully? The following example is probably not going to be the common use of the script but intended only to explain what the script should does. I took the 2 lists above and replaced/switched the 5-8th lines between those lists. Last edited by ovg on Tue Sep 19, 2017 10:52 am, edited 1 time in total.